See in store for our full range of adorable Beanie Boo animals. Each sold separately. Beanie Boos are the latest range of 6 inch cute and cuddly toys that can’t wait to come home with you! Each super soft Beanie Boo comes with adorably large button eyes and with lots of unique styles available, part of the fun is collecting them all! Characters in the range include; Slush the husky, Coconut the monkey, Bananas the monkey, Safari the giraffe, Wishful the unicorn, Cancun the pink chihuahua, Bugsy the ladybird, Muffin the cat, Stripes the tiger, Paddles the penguin, Ollie the octopus, Fetch the dalmatian, Peanut the elephant, Clover the lamb, Goldie the yellow chick, Speckles the leopard, Bamboo the panda, Sparkles the dolphin and Sting the bee. 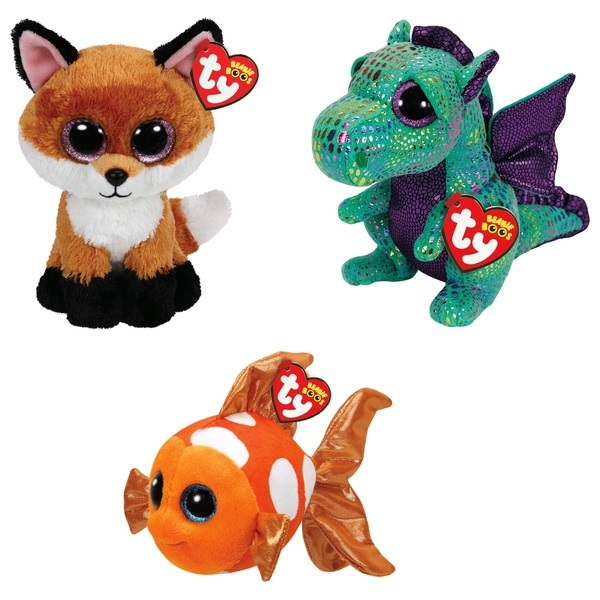 See in store for our full range of adorable Beanie Boo animals.